It says “Alabama the Beautiful” on the welcome sign and Forland Family Market is no exception to the rule. The market is across the street from the Farmers and Fishermens Market that sits on the pecan orchard. Alescia Forland, the Market Operations Manager, talked to us about how the Forland Family Market came to be. 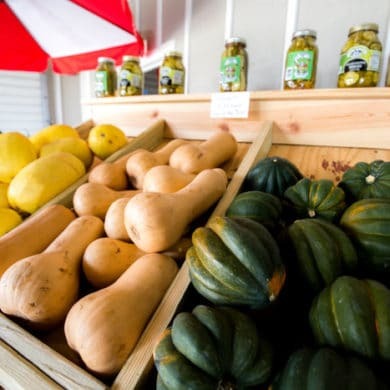 Forland Family Market carries everything from fresh produce to local honey and freshly baked bread. Alescia thinks that Forland is giving locals options. “Locals have enjoyed shopping here over the supermarket,” she says. “There’s a huge difference in quality.” And if it’s not local, Alescia is still sourcing only the best stuff. A big favorite at Forland Family Market is the tower of honey. Alescia can tell you where the honey is from and knows each farmer by name. This is actually more important than some may think. The market also has lots of organic meats from Alabama, locally sourced hydroponic lettuce and even soaps! For the best experience, make sure you stop by when the Farmers and Fishermens Market is open. The farmers market is open on Saturday from 9:00 to 2:00 and Tuesday from 2:00 to 6:00. Discover Alabama the “Fresh” at Forland Family Market. Forland Family Market is located at 20733 Miflin Rd, Foley, AL. For more information, visit the Forland Family Market website or call (251) 971-3276.